Selling out is a topic that comes up quite frequently in discussions pertaining to punk music. While it isn't necessarily always the case that a band signing to a major label is guaranteed to change their music in order just to make more money, it happens more often than not. I held on for a while to the idea that the increasing popularity of California punk band, Joyce Manor, couldn't possibly get in the way of the raw creativity and clever lyricism displayed on the band's 2011 self-titled LP. 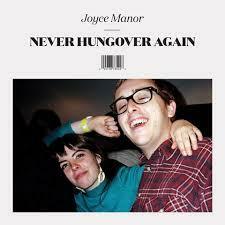 My hopes, however, were crushed with the release of their third LP, Never Hungover Again, on Epitaph Records. The opening track, "Christmas Card" sets the mood for the rest of the album with its exceptionally boring drum beat and generic chord progression, setting the universal tone that the entire album completely lacks originality. I thought for sure when I heard "End of the Summer" and "Victoria" that I was listening to Tigers Jaw (If you don't know who Tigers Jaw is, don't bother. They're terrible.). If I had to dig deep and try to find something positive to say about this album, I really like some of the guitar melodies. But even the parts that I find slightly appealing are unoriginal and ruined by lead singer and guitarist Barry Johnson's obnoxious whining of some of the most annoying lyrics I've ever heard, like: "I want a heart tattoo / I want it to hurt really bad / That's how I'll know / I'll know it's real / A real tattoo." I think when bands reach certain levels of popularity, you find that although they may have matured as musicians and people, there is this strong tendency to try and revert back to the sound accountable for their initial acclaim. While arguing that bands shouldn't resist creative evolution of their style is certainly valid, it is something that should be embraced in a manner that is less concerned with record labels and public opinion. Never Hungover Again doesn't sound like a new Joyce Manor album, it sounds like new Joyce Manor trying to be old Joyce Manor. Coincidental that this is the band's first release on major label? Talk about selling out. Will Taylor can be contacted at wTaylor@ErieReader.com.